In the winter, when I review my landscape, I always decide that I could use more evergreen shrubs. When the trees are bare and everything is brown and gray, evergreens really come to the fore. Of course, evergreen shrubs are wonderful for foundation plantings, but wouldn't it also be nice to have a permanent hedge to screen an unsightly view or provide privacy from the neighbors? They are also great to provide shelter for birds, as windbreaks, or to define a garden area. Evergreen shrubs come in two main categories--broad-leaved, and narrow-leaved. Broad-leaved evergreen shrubs, as the name implies, have broad evergreen leaves that can be prickly like holly or mahonia, or smooth like boxwood or nandina. Some of the broad-leaf types have added benefits, like the winter flowers of camellias and daphnes, or berries of hollies and viburnums. Narrow-leaved evergreens have needle-like or narrow leaves such as arborvitae, cypress, pine, or yew, and are available in many shades of green from gray-green to blue-green to golden-green. This page will focus on the broad-leaved evergreens. Review your garden and resolve to add more evergreen shrubs for winter color. Abelia x grandiflora, glossy abelia (semi-evergreen), Zonse 6-9. 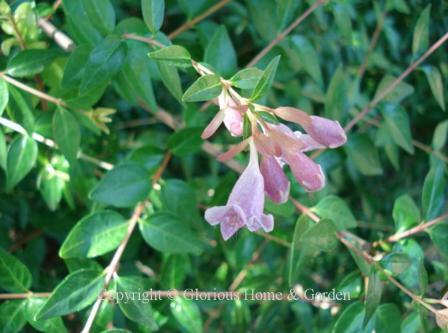 Very versatile, glossy abelia makes a nice hedge with its fine textured foliage, and it does well in sun or shade. It benefits from regular pruning to keep it dense and compact. The tiny tubular flowers appear over a long period in summer and into fall. 'Little Richard' is shown. Acca sellowiana (formerly Feijoa sellowiana), pineapple guava, Zones 8-11. 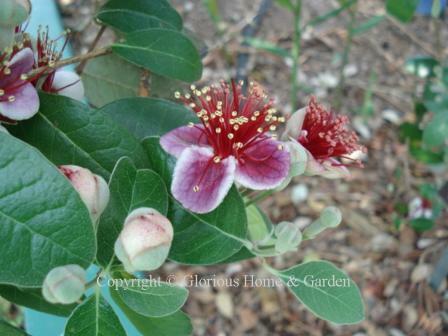 Pineapple guava forms a dense evergreen shrub to 10 - 15'. Late spring brings showy pink blossoms edged with white and prominent red stamens. The edible egg-shaped green fruits resemble green tomatoes when sliced and are sometimes called "summer tomatoes." Agarista populifolia, Florida leucothoe or hobblebush, Zones 7-9. This multi-stemmed shrub with arching branches is a great choice for shady situations and along stream beds. Arbutus unedo, strawberry tree, Zones 7-9. 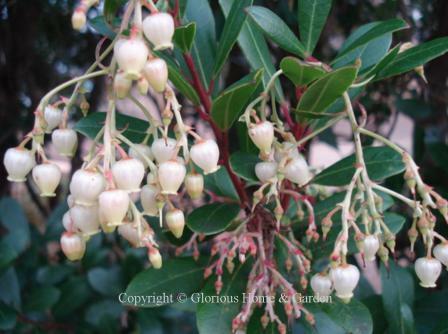 A nice broad-leafed evergreen shrub for the warmer zones because it blooms in the late summer and sometimes even into fall and winter, followed by strawberry-ish red fruits. This picture was actually taken in January at the State Botanical Garden in Athens, GA.
Aucuba japonica, Japanese laurel, Zones 7-10. This is a nice, neat, quiet, shade-loving evergreen shrub, the sort of thing that doesn't get noticed much, but is valuable for winter color. 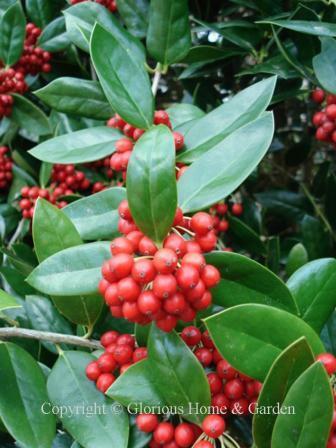 It produces clusters of red berries that peek through the leaves and persist through the winter. The variegated cultivar, 'Gold Dust,' is shown. Berberis julianae, wintergreen barberry, Zones 6-8. This evergreen shrub may turn a bronzy color in the winter, but it is can be planted for one of the densest, spiniest natural barrier hedges you can imagine. Allow to grow into its natural mounded shape where it has room to spread and resist the urge to prune. ‘Spring Glory’ is shown. Buxus microphylla, littleleaf boxwood, Zones 6-9. B. microphylla, native to Japan and Taiwan is a dense, small-leaved evergreen shrub with as many uses as B. sempervirens below. It is not quite as hardy as B. sempervirens and has a tendency to turn an orange-brown in the winter that looks as if it's dying. Protecting from strong winter sun and winds will help prevent this tendency. 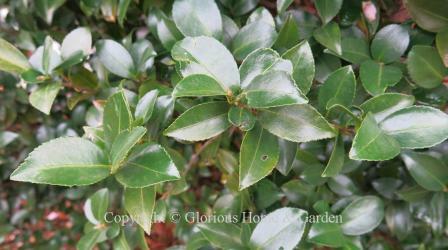 Buxus sempervirens, boxwood, Zones 5-8 (check particular cultivar for hardiness). Every time I visit Colonial Williamsburg, Virginia, I always have to stroll through the boxwood garden (below) next to the St. George Tucker House. 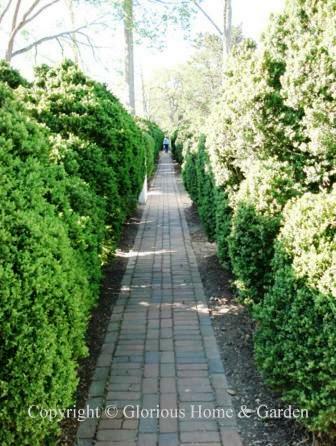 The scent of boxwood surrounds you as you walk the narrow brick paths. 'Suffruticosa' is a great variety to use for edging and formal beds as it is slow-growing and seldom reaches more than 3' in height, but can be easily kept small with pruning. Mine, after 11 years are only 1 1/2-2' tall. Topiary, anyone? Camellia japonica, Japanese camellia, Zones 7-9. These evergreen shrubs, showy in bloom and attractive all year with thick, shiny leathery leaves, are a mainstay of the Southern garden. The foliage with fat buds waiting to open anticipates spring. Depending on the cultivar, you can have japonicas that bloom from fall into spring. Click here for our Camellia japonica page. Camellia sasanqua, sasanqua camellia, Zones 7-9. 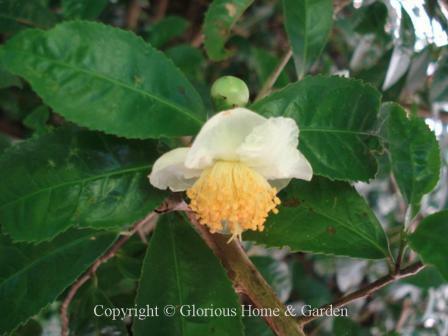 Camellia sasanqua is a neat and tidy evergreen shrub with smaller leaves than C. japonica. After blooming from fall to early winter, sasanquas are valuable the rest of the year for their handsome dark green foliage and make great hedges, borders, foundation plants and specimens. 'Yuletide,' shown below, is often in full bloom for the holidays. Click here for more Camellia sasanquas. Camellia sinensis, tea camellia, Zones 6-9. This is the plant from which tea is made, but it also makes an attractive evergreen shrub in the garden, useful for groupings, foundation plantings and additions to borders. Small fragrant white flowers bloom in the fall. 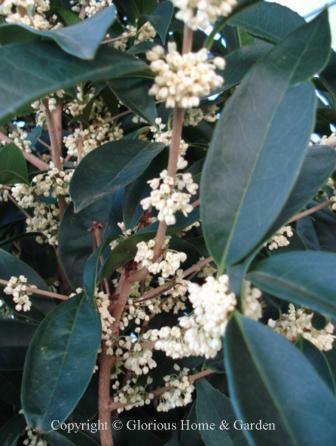 Danae racemosa, Alexandrian laurel or poet's laurel, Zones 7b-9. 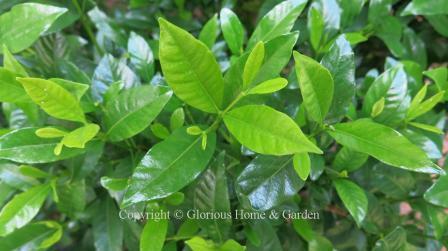 This is a nice evergreen shrub to use in shady areas, in fact, the leaves will discolor in strong sun. Slow-growing, it will reach about 3' in height. It has an open habit with slender arching branches the same color as the leaves. Small inconspicuous greenish-yellow flowers are followed by conspicuous orange-red berries in the fall. Daphne odora, winter daphne, Zones 7-9. Evergreen, winter-blooming, and intoxicatingly fragrant! What more could you want? This is a marvelous plant to have in the South. By the end of December or early January, the buds will begin to show color, and will be in full flower in February usually continuing into March. The fragrance is lovely, so plant where it can be appreciated near the house, or in a woodland setting with companions like hellebores, ferns, pulmonarias, early bulbs and Camellia japonicas. Daphnes like partial shade, morning sun, very good drainage (root rot due to poor drainage is the usual cause of daphne failure) and humusy, loamy soil. My favorite is 'Aureo-Marginata' (below) with leaves edged in cream and pink buds that open to pale pink (nearly white). Other cultivars include 'Greenleaf White' with green leaves and white flowers, 'Leucanthe' with deep green leaves and pale pink flowers, and 'Rubra' with green leaves and dark pink buds that open to lighter pink. Eriobotrya japonica, loquat, Zones 8-10. 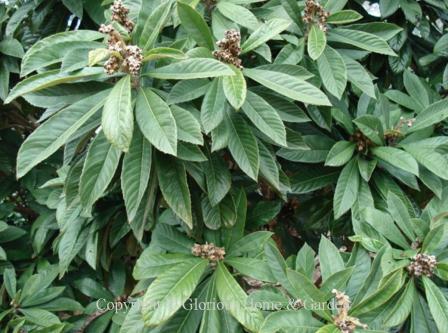 A semi-tropical large shrub or small tree, loquat has large, narrow evergreen leaves and makes a handsome specimen. The fragrant flowers appear in late fall to early winter and are followed by edible fruits. 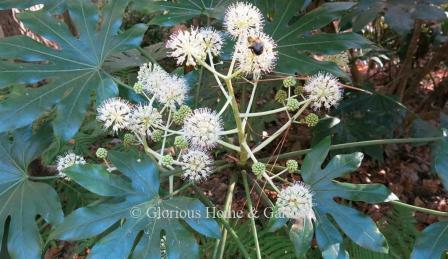 Fatsia japonica, Japanese fatsia or aralia, Zones 8-11. 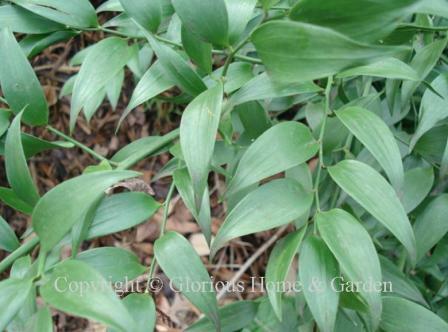 Bold, deeply divided finger-like leaves give this evergreen shrub a tropical air. The globular white flowers bloom in the fall and become decorative balls of black berries in late winter. Gardenia jasminoides, gardenia or Cape jasmine, Zones 7b-10. Gardenias are grown for their whorled, white fantastically fragrant blooms occurring in late spring to early summer, and often again in late summer to fall. But the glossy, slightly puckered, evergreen foliage is handsome also after the flowers have gone, so they are good choices for planting near a patio or deck. Ilex cornuta, Chinese holly or horned holly, Zones 7-9. 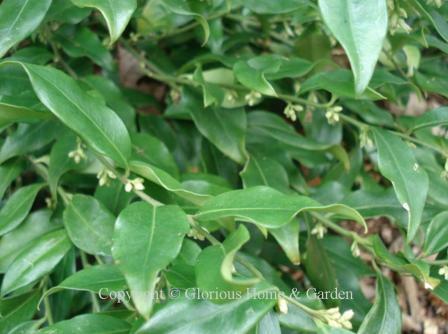 Chinese holly has stiff shiny leaves usually well-armed with prickles. The cultivar 'Burfordii' is widely planted and makes a good screen or specimen. It can be pruned up to form a small tree, and is very vigorous. We once pruned back several Burfords that were used as foundation plants at a house we bought and were severely overgrown. To rejuvenate them we cut them back to about 12" and they bounced back almost with arrogance. There are other cultivars worth seeking out, such as 'Willowleaf' below, with smoother leaves and bright clusters of berries. 'D'Or' has yellow berries. Ilex crenata, Japanese holly, Zones 5-7. Japanese holly has smaller leaves than Chinese holly and its finer texture makes it very useful for foundation plantings, borders, and more. It can be pruned and shaped much like boxwood, and also makes a good subject for bonsai. Good to use in place of boxwood for those who find the scent of box objectionable. The black berries are usually hidden under the leaves. There are so many cultivars that it is best to visit your local nursery for the best ones for your area. Ilex glabra, inkberry or gallberry holly or Appalachian tea, Zones 5-9. 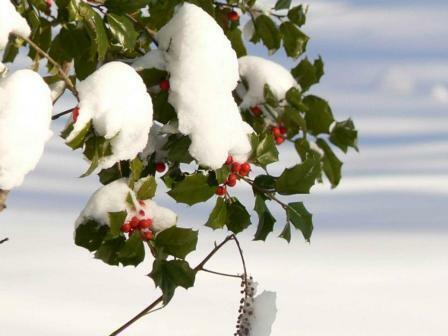 This is a native North American holly which has become increasingly popular for home and commercial landscaping uses due to its dark green evergreen foliage, hardiness, and general lack of severe insect and disease problems. The species can form large colonies via suckers. Black berries ripen in fall and persist through the winter unless devoured by birds. 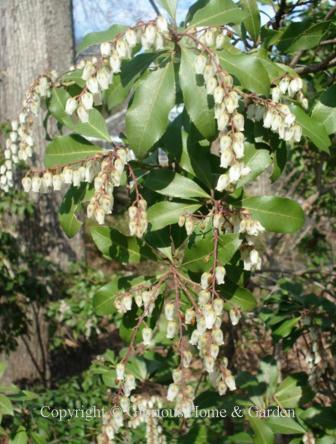 Gallberry honey derives from this plant and native Americans used it to make a tea. Great for hedges, foundation planting, masses, borders and natural areas. Illicium anisatum. Japanese anise, Zones 7-9. Japanese anise is an evergreen shrub or small tree with white blooms in spring. Illicium floridanum, Florida anise, Zones 6-9. This native American evergreen shrub grows to about 6-8' tall and has medium green leaves with dark burgundy red fragrant flowers in spring. Kalmia latifolia, mountain laurel, Zones 4-9. 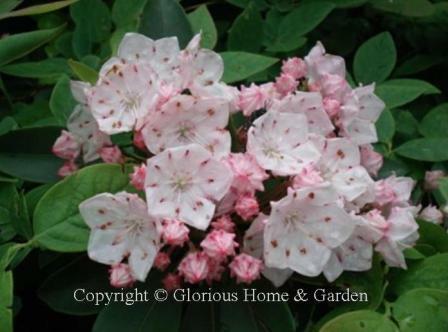 Certainly, one of our most beautiful native evergreen shrubs, mountain laurel prefers cool, moist conditions and well-drained soil amended with soil conditioner and pine bark. A natural companion for rhododendrons. Gorgeous clusters of flowers occur in spring in shades of white, pink and rose. 'Sarah' is shown below. 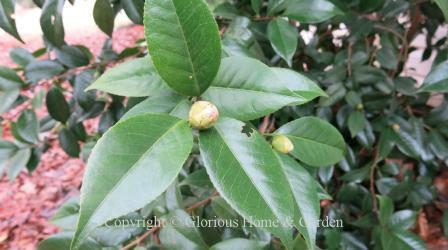 Laurus nobilis, bay laurel or sweet bay, Zones 8b-10. 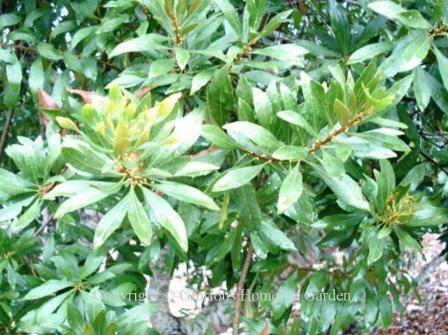 Bay laurel produces aromatic leaves that are used to flavor savory dishes. The ancient Greeks and Romans fashioned bay laurel leaves into wreaths as a symbol of high status or victory. In the warmer zones where it can be grown outdoors, it is a fine shrub for borders, hedges or specimens. Elsewhere, it is better grown as a pot plant to enjoy on the patio and brought indoors in winter. Ligustrum japonicum, Japanese privet, Zones 7-10. A very widely used evergreen shrub in the South used for hedging, foundation planting (though often outgrows its bounds) and specimens. It can be a handsome hedge, or even a small tree if pruned up. Triangular shaped trusses of white flowers occur in April-May (and have a rather obnoxious odor), followed by black fruits. Not reliably hardy above Zone 7, and even in Zone 7 can be severely defoliated by a particularly cold winter. Loropetalum chinense, Chinese fringe flower, Zones 7-9. 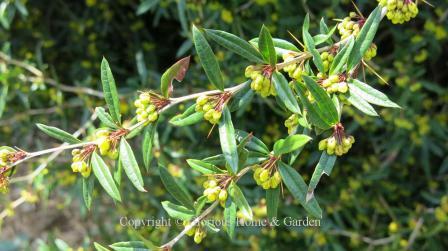 What an explosion of popularity this evergreen shrub has enjoyed in recent years! It has become the darling of landscapers and homeowners alike, and why not? It is easy to grow in sun or semi-shade, blooms profusely in the spring, so much so that the foliage is all but eclipsed, repeats itself sporadically in the fall during warm spells, and makes a neat handsome foliage shrub the rest of the year. 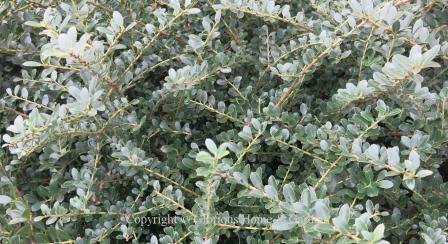 It has a multitude of uses as well--foundation planting, hedging, masses, accents, mixed shrub borders. There are cultivars on the market to suit just about any situation. Most have pink flowers (some screamingly so), but there are white ones also, and green to burgundy foliage options as well. Magnolia figo, banana shrub, Zones 8-10. 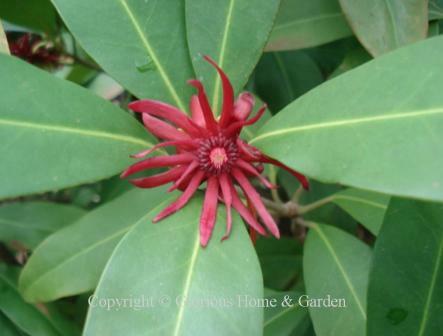 A lovely evergreen shrub in the magnolia family for the South. The small, creamy flowers often marked with purple, are shaped like miniature Magnolia grandiflora blooms, and have a delightful fragrance like bananas. Likes full sun to partialshade and reaches a mature size of 6-10’ high and wide. Formerly known as Michelia figo. Mahonia aquifolium, Oregon hollygrape, Zones 5-7. This evergreen shrub, a native of the Pacific Northwest, has fragrant, bright yellow blooms that occur in spring. The foliage is spiny resembling holly leaves, and the fruit is blue-black resembling grapes--hence the common name. Mahonia bealei, leatherleaf mahonia, Zones 7-9. 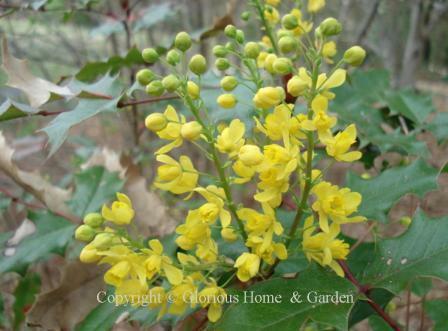 A Chinese cousin of Mahonia aquifolium, Mahonia bealei has softer yellow blooms (also fragrant) that occur in late winter to early spring. The grape-like berries appear in clusters in late spring. Nice for a woodland setting as it prefers shade and is a bit gangly in habit. Mahonia eurybracteata selections, grapeberry mahonia, Zones 7-9. 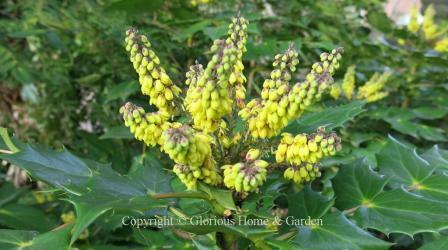 A mahonia without prickles? You bet! ‘Soft Caress,’ from the Southern Living Plant Collection, was named the Plant of the Year at the by the Royal Horticultural Society at the 2013 Chelsea Flower Show and for good reason. Not only are the leaves spineless, but they have a soft, bamboo-like quality. Spikes of yellow flowers in late winter are followed by blue berries. ‘Soft Caress’ will grow to about 3’ with equal spread in partial to full shade. Another interesting M. eurybracteata, introduction, ‘Marvel,’ also from the Southern Living Plant Collection, grows larger to about 6’ tall and 4’ wide, with wider leaves, and unlike ‘Soft Caress,’ each leaf is tipped with a sharp point. The branches grow in tiers around the plant topped in winter with bright yellow sprays of flowers followed by blue berries. Myrica cerifera, Southern waxmyrtle, Zones 7-11. The southern equivalent of the bayberry (Myrica pensylvanica), waxmyrtle makes a fast-growing hedge, screen or even a small tree if limbed up. 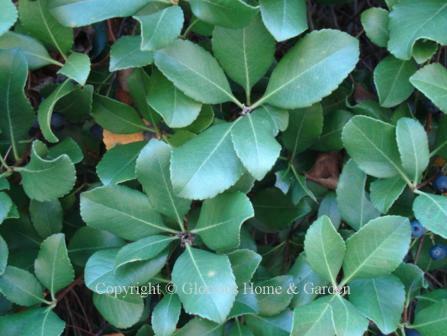 The narrow leathery leaves contain glands with the aromatic compounds that produce the distinctive bayberry scent. Birds absolutely relish the waxy gray berries and a flock of cedar waxwings will strip them in no time! Native to the southeastern U.S., waxmyrtle, like bayberry, is great for use along the seacoast. Nandina domestica, nandina or heavenly bamboo, Zones 6-9. This is a very common evergreen shrub in the South prized for the large sprays of red berries that are often used for Christmas decorations. ‘Alba’ has white to yellowish berries. 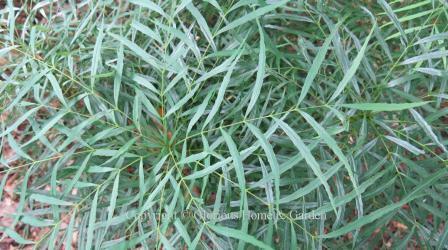 The leaves and stems resemble bamboo hence the common name and turn red-purple in the fall. The species can reach about 8’ and form suckering colonies, and tend to get leggy with age. Nandinas are used for a multitude of purposes including foundation plantings, shrub borders, hedges and mass plantings. Many new cultivars have been developed that have increased the usefulness of the plant even more. There are dwarf compact forms that make good ground covers or edgings. 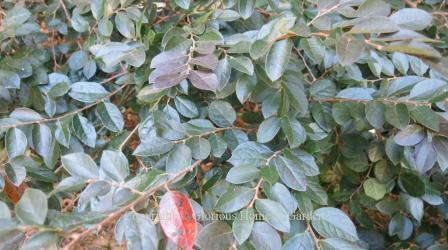 Some have particularaly bright new foliage in spring and again the fall and winter. ‘San Gabriel’ has very narrow leaves and a softer appearance. Your local nursery should have a good variety for every purpose. Nerium oleander, oleander, Zones 8-11. 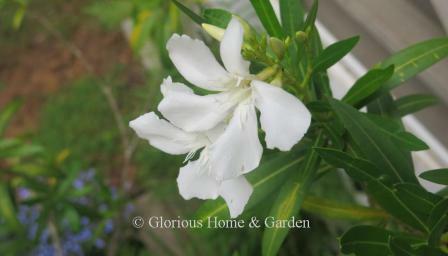 Oleanders are ubiquitous in Florida and along the southern coast. I'm in north Georgia, so I have mine in a pot that I keep in an unheated garage in the winter, and bring out on the patio after frost danger is past. Available in a wide range of colors. Osmanthus fragrans, fragrant tea olive, Zones 7-10. Every Southern garden should have at least one fragrant tea olive in it. 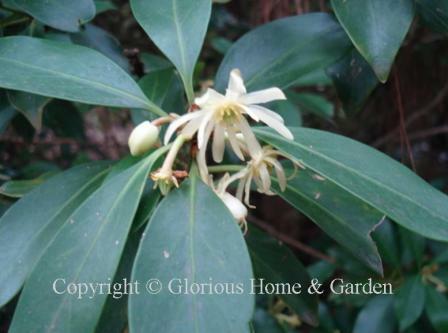 The fragrance can perfume your entire garden in autumn, sporadically in winter when mild, and early spring. The fragrance is divine, and guests will wonder where it is coming from as the individual flowers are tiny, but they are produced in abundance. The variety, ‘Fudingzhu’ is outstanding with white flowers. When I moved recently (2016), I had to leave a mature one behind, so a new ‘Fudingzhu’ was one of the first plants I bought for the new garden. I also got hooked on the orange form, f. aurantiacus after seeing it in bloom at the Atlanta Botanical Garden. 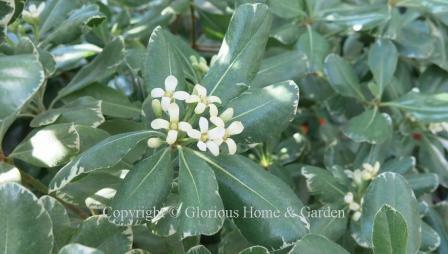 Osmanthus heterophyllus, holly osmanthus or holly tea olive, Zones 6-9. Highly fragrant, and hardier than O. fragrans. Most cultivars have spiny leaves resembling holly. 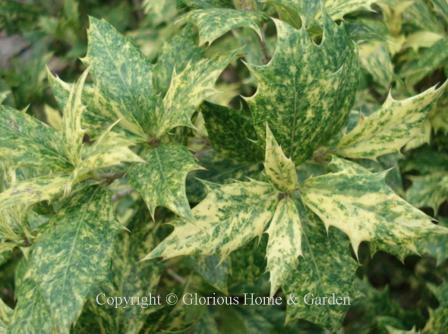 ‘Myrtifolius’ has smooth-edged leaves, ‘Goshiki,’ below, has very handsome variegated leaves. Pieris japonica, Japanese pieris, Zones 4b-7. Sometimes called “lily-of-the-valley” shrub for the long racemes of small white flowers that resemble lily-of-the-valley, this shrub is excellent for shady situations under tall trees. Pittosporum tobira, Japanese pittosporum, Zones 8-10. 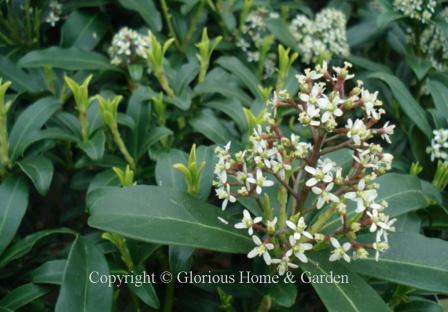 This attractive evergreen shrub is popular in the South where it is prized for its fragrant blooms in the spring. 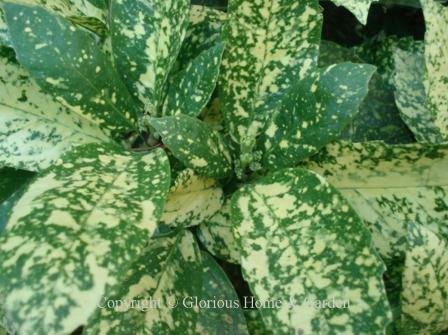 ‘Variegata’ is particularly attractive. 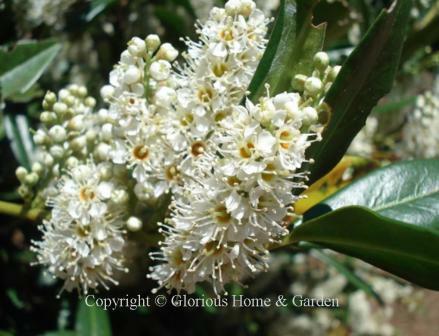 Prunus laurocerasus, English cherrylaurel, Zones 6-8. A handsome dark green dense evergreen shrub widely used for foundation plantings, hedges, screens, and mass plantings. Fragrant white flower spikes appear in spring followed by black berries. ‘Otto Luyken,’ shown below is a very popular cultivar prized for its compactness. It grows about 3’ tall and 6’ wide. Pyracantha coccinea, scarlet firethorn, Zones 6-9. Beware the thorns! This plant isn’t called firethorn for nothing. But those thorns make it one of the best impenetrable barrier plants you can grow. 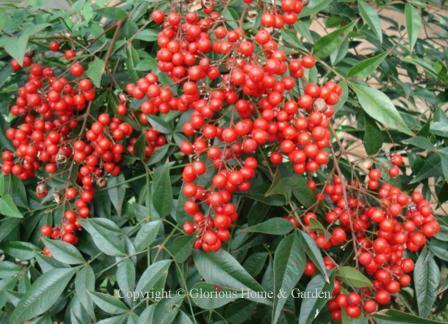 The other main reason to grow it is for the bright display of orange-red berries in the fall. 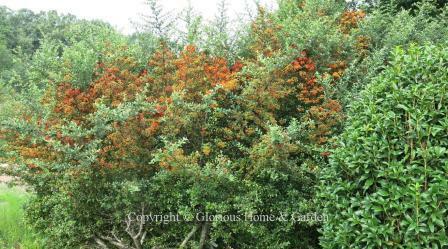 Besides its talents as a barrier, pyracantha is often espaliered against a wall or trained on a trellis to good effect. Rhaphiolepis umbellata, Indian hawthorn, Zoness 7-10. This a neat attractive evergreen shrub that minds it manners. Attractive in flower in spring in white or pink , it sort of fades into the background in summer until it decorates itself with blue berries for the fall into winter. Flowers are typically white or pink. Click here to go to the Rhododendrons and Azaleas page. Sarcococca confusa, sweetbox, Zones 7-9. The tiny white flowers tend to hide under the leaves, so are a bit shy, but there’s nothing shy about the sweet fragrance they exude in winter. Nice ot have in a shady, woodland garden. These evergreen shrubs form a rounded mound to about 5’ at maturity with an equal spread throught suckering, but growth is slow. Skimmia japonica, Japanese skimmia, Zones 7-8. Skimmia is a lovely evergreen shrub for shady, or semi-shady locations. This shrub grows into a well-behaved mound of about 3’ in height with equal spread. The foliage is fragrant when crushed. The plants are dioecious, and though both male and female plants produce sweetly fragrant white flowers, be sure to include a male pollinator among a group of female plants to ensure good production of bright red berries. Ternstroemia gymnanthera, Japanese ternstroemia, Zoness 7-9. 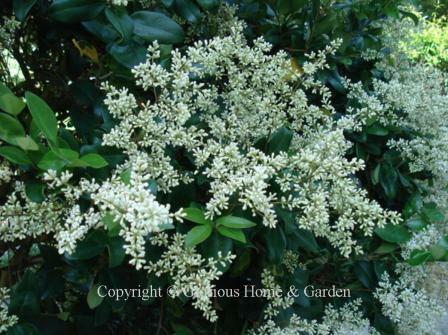 Also known as Cleyera japonica, this broadleaf evergreen shrub can get quite large—up to 10’. Nevertheless, builders like to use it for foundation planting, eventual size notwithstanding, requiring consistent pruning to be kept in bounds. The whorls of leaves are attractive, and the fruits that appear in late summer and persist into fall are decorative. Viburnum cinnamomifolium, cinnamon-leaved viburnum, Zones 7-9. 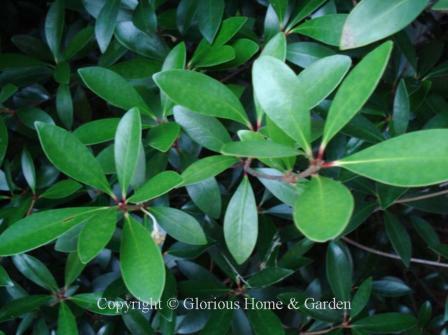 This is a handsome evergreen shrub gaining in popularity in the South. 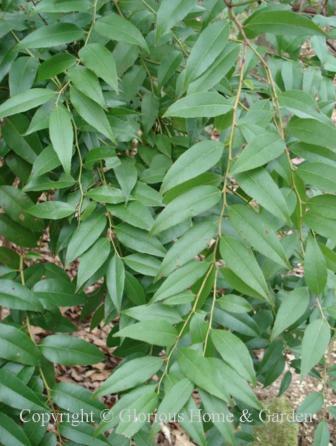 It is similar to V. davidii but with larger tri-veined leaves, red stems, and much larger overall, in fact it can develop into a large shrub or small tree of up to 8-10'+. White flowers appear in the spring. Viburnum davidii, David viburnum, Zones 7-9. 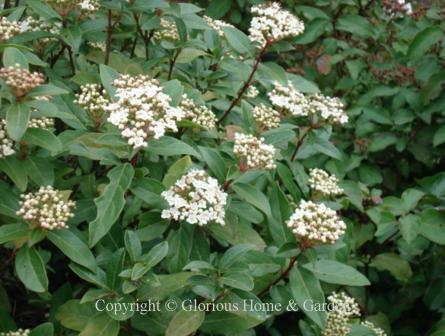 David viburnum is a low-growing mounded shrub to about 2-3' with ribbed leathery leaves. 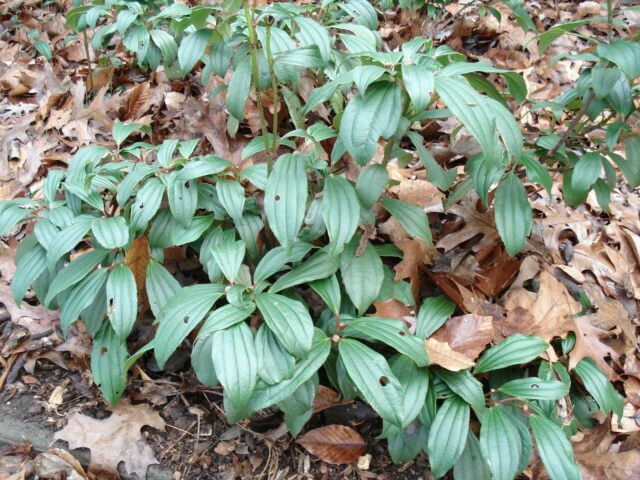 It likes shade and is good for foundation planting, masses as a ground cover or as a companion with other woodland plants like epimediums, hostas, ferns, and azaleas. White flowers in spring lead to bright blue berries in fall. Viburnum tinus, laurustinus, Zones 7b-10. Laurustinus makes an attractive evergreen hedge, screen or garden accent for winter color, and grows to about 6-12.’ Pink buds open to white flowers in late winter or early spring followed by blue fruits. 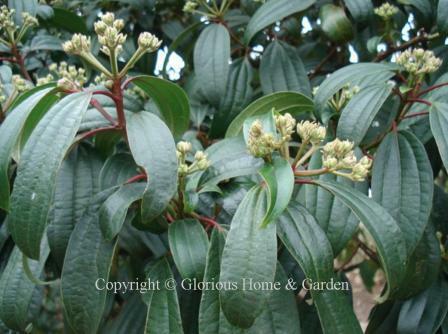 The common name derives from the resemblance of the leaves to bay laurel (Laurus nobilis). ‘Spring Bouquet,’ pictured, is a smaller, more compact variety than the species. ‘Bewley’s Vaiiegated’ has cream-edged leaves.